THE need for government to generate revenue for its developmental projects is very important. In developed countries across the globe, default in payment of tax is a very serious offence. No wonder then the citizens and corporate bodies dread to default their civic responsibilities. For a developing country like Nigeria, the need for well-coordinated sentitisation programmes on the need for all to pay their taxes as when due is paramount. This is more so because of the aversion of many to payment of taxes, believing that the bulk of revenue so generated often end up in private accounts with no development projects to show for it. Perhaps, with the renewed effort of the present administration to curb the excesses in government and the civil service, more people would come to better appreciate why they should pay their taxes as at when due. Talking about taxation, there appears to be a renewed clamour by some for religious organisations to pay taxes. They argue that churches make money from some of their ventures. Well, like I re-iterated in an earlier write-up, compelling religious bodies to pay taxes would spark off chains of negative consequences that would not go down well for all. In the first instance, it is a fact that Churches, (genuine Churches and Mosques, etc) are meant to be non-profit organisations. They are meant to alleviate lapses in the social and religious lives of the people. I have always stressed that government cannot do it all. On daily basis, religious bodies are carrying out numerous philanthropic and life-changing projects. In a country like ours, where there are no social-welfare programmes for the downtrodden, religious bodies remain the last hope of the common man, the poor and the broken hearted. Granted that government is continuously looking for more funds to execute projects, does that then justify taxing Churches, which, as we know, provide very essential spiritual and social services? 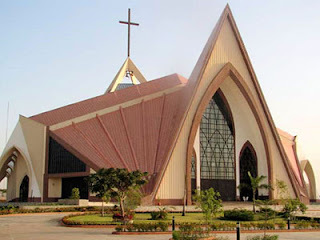 Indeed, it is on record that today, many churches help to provide jobs for many, as well as assist in the infrastructural development of the society. Also, a good number of them like the Catholic Church are noted for their philanthropic activities, which permeate all segments of the society. I believe strongly that churches should not be taxed because of the invaluable contributions they make to the society in the areas of education, health care delivery and others. On the issue of Churches conducting businesses, it depends on the type of business. Most of the business endeavours embarked upon by the Catholic Church for instance, are humanitarian in nature. The funds so generated are, therefore, plowed back for the good of the society. However, there are cases of people with questionable character, using the church for nefarious activities. That is another issue that borders on church licensing guidelines and monitoring, which a body like CAN and the law enforcements agencies may wish to look into. This, notwithstanding, we have laws guiding business operations and those involving non-profit making organisations. Any attempt to bend the law for selfish and egoistic reasons would only cause more problems in a complex society like ours, where religion is a sensitive issue. Very Rev. Msgr. Osu, Director, Social Communications, Catholic Archdiocese of Lagos.